Jeez, so 8 tithe bloothirster moving and charging is a thing? Nasty. Reading the AoS 2.0 errata for BoK around summoning, can daemons move after summoned? It doesn't seem to mention that they can't (I'm assuming they can't). Are Chainrasps battleline for LoN aswell? Really hoping so. So, are Squig gobbas awesome now? That is much better! Thanks mate. 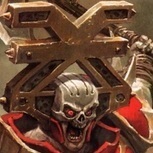 Where are you guys finding the new warscroll guys? My Sigmar app is still showing the old one even though I updated it. My 1500 list is: 2 x Megaboss with ToP or BB depending on the opponent 1 x Chanter 2 x 10 'Ardboys 1 x 10 Brutes 2 x 5 brutes Ironfist It plays quite nicely. These look great. Any left? Could do with 20. Hi all Does anyone have any experience in magnetising the weapon options on the Stormcast Paladins? How easy was it to do? Ah I missed the battleline! Got carried away. I'll have to take out the fanatics for more grots perhaps.